The Brattleboro Music Center’s new Season Guest Concert series continues Saturday, October 20, at 7:30pm in the BMC Auditorium with Sō Percussion, a group dedicated to promoting the power of music to unite people and forge deep social bonds. This groundbreaking Brooklyn-based quartet redefines the meaning of the term “percussion ensemble.” Though established in 1999 to play contemporary classical works, they have worked with a wide range of composers, musicians, and recording artists in everything from tea cups and walnut planks to flower pots and amplified cactus. 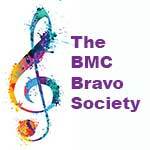 This benefit concert, sponsored by Guilford Sound, will support the BMC’s Make a Place for Music capital campaign. The performance also celebrates completion of the BMC’s new percussion studio and the launch of the first full-fledged, year-round percussion program housed at the BMC. Tickets are $20 general admission, $15 for students. For more information, visit the BMC website at bmcvt.org or call 802-257-4523. Sō is Eric Cha-Beach, Josh Quillen, Adam Sliwinski, and Jason Treuting, who create innovative multi-genre original productions, sensational interpretations of modern classics, and an “exhilarating blend of precision and anarchy, rigor and bedlam,” (The New Yorker). 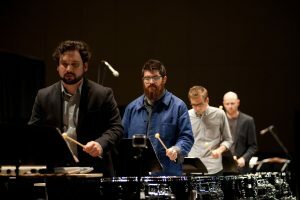 The group has redefined the scope and vital role of the modern percussion ensemble, with a repertoire that ranges from “classics” of the 20th century, by John Cage, Steve Reich, and Iannis Xenakis, et al, to commissioning and advocating works by contemporary composers such as David Lang, Julia Wolfe, Steve Mackey, and Caroline Shaw, to distinctively modern collaborations with artists who work outside the classical concert hall, including Shara Nova, the electronic duo Matmos, the choreographer Susan Marshall, Wilco’s Glenn Kotche, The National’s Bryce Dessner, and many others. Included in the evening’s program will be works such as Music for Pieces of Wood by Steve Reich; Living Room Music (excerpt), John Cage; Taxidermy by Caroline Shaw; and Selections from Amid The Noise by Jason Treuting.